As is the nature in boxing, for the championship hopes of one fighter to be elevated, most often the hopes of another must be stifled. Such was the case last Friday night at the Little Creek Casino in Shelton, Washington as undefeated Andrey Klimov defeated the resurging John Molina Jr. via a close ten round majority decision, placing himself in line for a title shot while slowing the progress of the once highly tauted Molina. In the headline bout of the ESPN Friday Night Fights televised card, Klimovsk, Russia’s Klimov (16-0 8KO’s 137.5 lbs. ), and Covina, California’s Molina (25-3 20KO’s 137.5 lbs.) delivered a closely fought, back and forth fight, with both combatants having their moments. Early on in the bout it was Klimov’s jab and quick lateral movement that dictated the pace of the fight. For the first three rounds Klimov moved in and out of the pocket and fired off hard right hands to the chin, tying his opponent up when he got to close. Molina pressed forward, but seemed confused as to how to shorten the gap and stay close enough to do damage. In the fourth Molina seemed to find his rhythm, though, and began to cut off the ring and keep the fight in the pocket. 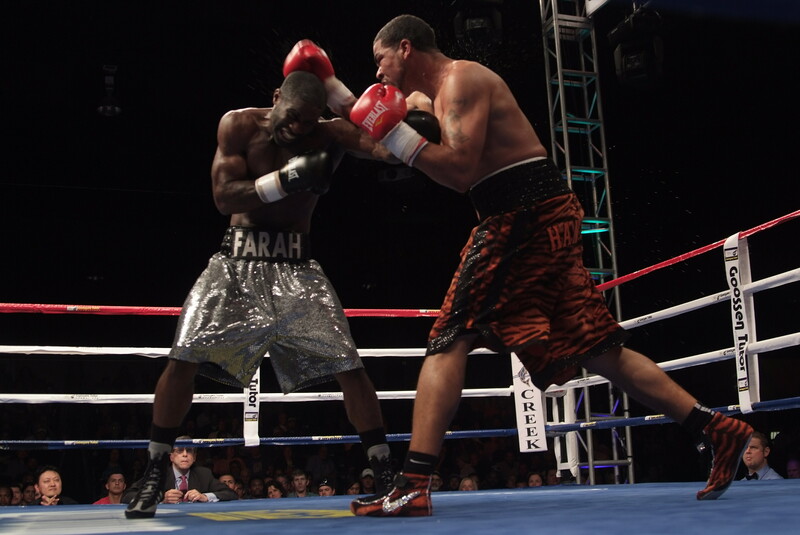 Throughout the middle rounds, Molina pressed the action and made the fight a brawl, favoring his more aggressive style. Klimov, who is more comfortable on the outside, fought back well in close, but it was clear Molina was getting the better of it. Late in the fight Klimov found his range once again with his jab, snapping it in his opponent’s face before following up with quick combinations. Molina stayed on task, though, pressing hard and making the rounds close with his aggression and hard power shots, but the busy work rate and skilled boxing of Klimov secured him the decision. The judges’ scores read 97-93, 96-94, and 95-95, awarding Klimov the majority decision. With the win Klimov, who currently holds the IBF lightweight intercontinental title, claims not only his sixteenth victory as a pro, but a win over arguably the best opponent he has faced so far, certainly raising his stock among aspiring world title contenders. In the ten round co-feature, Philadelphia’s Farah Ennis eked out a close unanimous decision over Anthony Hanshaw of Kernersville, North Carolina. Hanshaw (23-3-2 169.5 lbs) got off to a good start, pressing the fight early with a good jab and a steady work-rate as his opponent chose to sit back and patiently wait for openings. Ennis (21-1 12KO’s 168.75 lbs.) began to pick up his tempo in the second round and by the third he was working effectively with counter right hands and left hooks. The fight stayed close throughout the majority of the middle rounds, with both fighters trading momentum, Ennis effective as a counter puncher and Hanshaw finding success when he pressed behind his jab. Late in the fight, though, Ennis began to build up momentum as he pressed the action with effective rights. Going into the last round the fight seemed up for grabs on the cards, but it was Ennis who punctated the fight, dropping Hanshaw with a flush right to the chin. After the mandatory eight-count, Ennis pressed, unloading on his hurt opponent, giving the crowd an exciting ending to a good fight, but he was unable to close the show with a stoppage. All three judges scored the fight for Ennis with scores of 96-94, 95-94, and 96-93. Portland, Oregon’s Ray Lampkin Jr. is quickly building a large fan following in the region and for good reason: the quick-fisted boxer-brawler makes good fights. Even when facing an out-matched opponent as was the case in his four round swing bout against Anaheim, California’s Joaquin Chavez, the fighter gives his fans excitement. At the start of the bout, Lampkin (4-0 1KO 137 lbs.) employed a technical approach, using his jab and lateral movement to move in and out of range. For most of the first round he peppered his opponent with quick combinations, before moving out of range to avoid any retaliation, easily taking the round with effective boxing. In the second, though, Lampkin changed his tactics. Instead of staying at a range where he could hit and move, he chose to step in aggressively, unloading with quick power shots. 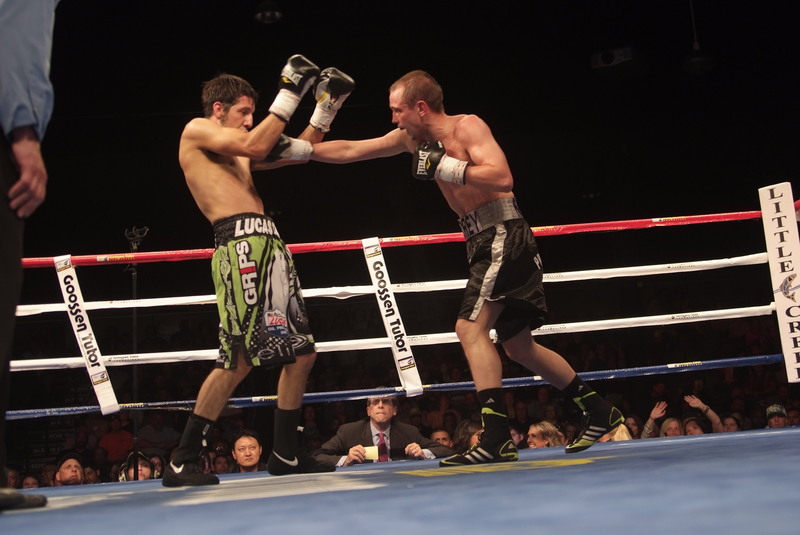 This approach gave Chavez (4-7-2 2KO’s 137.5 lbs.) opportunities to land, and the fans in attendance some great exchanges. For the remainder of the fight Lampkin fought in close, trading hard punches with Chavez and getting the better of it. The difference came down to hand speed. Lampkin, while giving his opponent opportunities to land in close, was simply too quick for Chavez and managed to land first and often throughout the fight. All three judges scored the fight a shutout at 40-36. Fighting under the tutelage of well known trainer Joe Goossen ,Van Nuys, California’s Maurice Lee (2-0 2KO’s 138 lbs.) made short work of Aberdeen, Washington’s Jeff Hatton (0-1 140 lbs.). Lee, a quick, crafty southpaw, pressed early with a strong jab and hard straight lefts. Mid-way through the first round he buckled the knees of Hatton, sending him reeling to the ropes. Hatton, who was making his professional debut, made it out of the round, but it was clear the bout would not last much longer. In the second round a hard body shot dropped Hatton for an eight count. Seconds later Lee found his mark once again, this time with a right hook, dropping Hatton for a second time. The action resumed, but only long enough for Lee to unload with a vicious left hook, dropping Hatton and prompting the referee to step in and stop the fight. The end came at 2:57 of the second round. Chinese transplant Ik Yang is stirring up quite a bit of excitement in the Pacific Northwest. The power punching prospect now residing in Spokane, Washington has a lot of people hopeful for what he may be able to accomplish in the fight game. Fighting in only his second fight in the U.S., Yang (13-0 9KO’s 139.25 lbs.) delivered another impressive performance, knocking out Orlando, Florida’s Roger Rosa (5-3-1 138.5 lbs.) in the first round. Rosa opened up the bout with three stiff jabs to the face of Yang in the first few seconds of the bout, marking his only moment of success in the fight. The small barrage seemed to anger Yang as he immediately opened up with an attack of his own, pushing Rosa back along the ropes. A hard right uppercut buckled the knees of Rosa, prompting the referee to step in and administer an eight count. After the count, Yang pressed again, dropping Rosa with a jarring right hand to the chin. Seconds later Yang cornered Rosa, unloading with a vicious onslaught, forcing the referee to step in and call it at 2:08 of the first round. Santa Clarita, California’s Said El Harrak, also trained by Joe Goossen, added his eleventh win as a pro with a third TKO over the durable Paul Mpendo. Harrak (11-2-1 6KO’s 154 lbs.) fought at a measured pace early on in the bout, using his jab to control the distance and keep his shorter opponent at bay. That changed in the second round as Mpendo (7-11-4 3KO’s 154 lbs.) began to press the issue, bulling his way in with hard looping shots. Harrak stood his ground and traded with the aggressive Mpendo, landing the more effective power shots in close. In the third round Harrack cracked Mpendo with a thudding right hand, sending him crashing to the canvas. After the count Harrak pressed, wobbling his opponent with a short left hook. The referee stepped in as Harrak closed in for the kill, saving Mpendo from any further punishment. The end came at 2:05 of the third, marking the first time Mpendo has been stopped in his career. The evening’s opening bout was a rematch between Tri-Cities, Washington’s Andres Ramos (3-0 125 lbs.) and Portland, Oregon’s Sammy Perez (1-2-1 126 lbs.). The two had fought just two months prior, with Ramos taking a close four round decision. The rematch was a see-saw battle with both fighters having their moments. Perez was effective in close where he was able to force exchanges and land hard shots to the head and body. Ramos, meanwhile, was the busier fighter at range, using his long jab to keep the action at a distance where he could land and move away from his opponent’s retaliatory swings. Opinions were split as to who had won the bout among ringside observers, some liking the pressure of Perez while others liked the more technical style of Ramos. In the end the official judges were also split, scoring the bout a majority draw. Hopefully we see these two tough combatants in the ring against each other again soon.